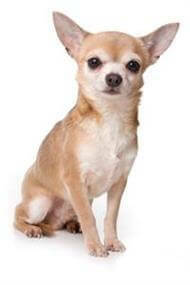 The Chihuahua is the world's smallest dog and its history is shrouded in mystery. Some believe that it originated in Asia, others that it came from Europe. But no matter where the breed got its start, it really is a dog of Mexico. Figurines found in Chi-Chen-Itza, Colima, and other ruined cities of the South American continent are very much like the present day Chihuahua. This coupled with the fact that in several Mayan dialects ‘chi’ means dog, would seem to place the ancestors of the Chihuahua in the Mayan period. With these little dogs a healthy female usually weighs 1.8kg and is just 15cm tall, while the male is not much bigger at 2.7kg and 20cm tall. The Chihuahua is a great little companion dog that is just as content to exercise itself in the back yard as it is to take a long, sprightly walk. Despite their size, these happy dogs are ‘blessed’ with a surprisingly loud bark and thrive on human company. The Chihuahua is truly a companionable animal and therefore thrives on the company of other animals. It will stand up for itself, but if you do have big dogs in the home it is best to keep an eye on this little dog while it is playing with them just to make sure all is well.